Welcome to the Stearns Violin Shop!! Welcome to Stearns Violins, Inc., a fine violin shop in beautiful Hartville, Ohio, conveniently located near Akron, Canton, and Cleveland. We are a professional violin shop, specializing in violin making, restoration, repair, and instrument appraisal. We love our customers and your needs are important to us. As a musician, string teacher, or collector of violin family instruments, we are here to make your life easier. Whether you need a bow rehaired or are looking for a new instrument, Stearns Violins is here to meet your needs. We have the largest inventory of fine violins, violas, cellos, and basses and bows in Northeastern Ohio. Our nationwide rental program that is second to none. Violin making started out as a fascination for Rodger Stearns as a boy of fourteen, when he made his first violin under the direction of a master craftsman. Throughout the ensuing years this unique craft has been developed through study and diligence in applying the age old secrets of the fine masters. Robert, the CEO and President of Stearns Violins, Inc., has been a repairman and restorer for over 18 years. His interest in violin restoration led to tutelage under his father, Rodger Stearns. Together they have attended the Oberlin Violin Restoration workshop for many years studying under masters such as Andrew Dipper, Jean-Jacques Fasnacht, Jeff Holmes, David Burgess, and others. Over the years, Robert has been a regular participant in the Oberlin workshops, as well as the Violin Society of America. In addition to his involvement in the violin world Robert holds a Master’s degree in Ancient and Near Eastern Archaeology and Language from Trinity Evangelical Divinity School. He is an adjunct professor of archaeology and Bible at Indiana Wesleyan University. Robert also serves the community as a volunteer firefighter and EMT. He is married to Jessica Stearns, a prominent violin teacher and performer in the area. Rodger Stearns has been making and restoring violins for over 50 years. In 1988 his keen interest in fine instrument restoration led him to Oberlin Violin Restoration Workshop where he studied with Vahukin Nigogosian, Hans Weishaar, Louz Belini, Horasio Pinero and other fine restorers over the course of 6 summers. (During those years the Oberlin Restoration Workshop was 4 weeks long in the month of July). Over the last many years Rodger has been a regular participant in the Oberlin workshops. In addition to his involvement in the violin world, Rodger has a Master’s Degree in Christian Ministries from Malone University and is the Chairman of the Ministerial Department of Allegheny Wesleyan College. Rebecca works with our Social Media and as our Bow Technician. She has a BA in Education in English. She is Rodger and Eunice’s daughter and was been raised in the violin shop. Rebecca has two children, 11 and 13. Sue joined our team in 2014. She enjoys working with the office duties and becoming acquainted with our customers, whether by phone or in person. She has served with her husband, Rohn Stearns, in the ministry for 29 years. They are the parents of a son and three daughters and enjoy being grandparents to ten wonderful grandchildren. 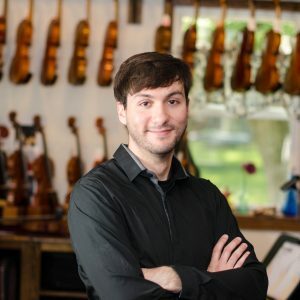 In addition to the set-up and repair work he does for the violin shop, Josh is a cellist performing and teaching actively throughout NE Ohio. He received his Bachelor of Music in cello performance from Bowling Green State University and is pursuing his Masters in Music Education from the University of Akron. Outside of cello and the shop, he enjoys cooking, hiking, weightlifting, and more.